You'll notice I am doing my post a day early. I have too much scheduled tomorrow. I survived Halloween. The photo above is of my front porch last night. 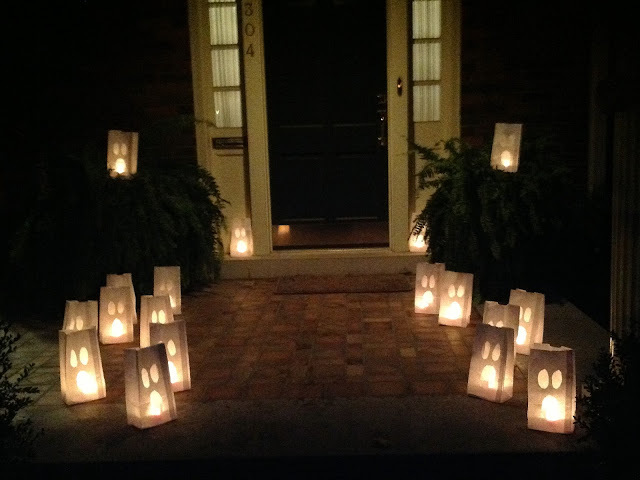 I generally put the luminaries along the curved sidewalk to the house but it was raining, not that I am complaining at all. We had it so much easier than those on the eastern seaboard. I did feel sorry for the trick or treats but it looked like they had fun anyway. When my children were small I used small pumpkins as luminaries. I used a power drill to put lots of holes in them. I'd carve 20 or so. These luminaries took a fraction of the time and can be used again. I got a few orders for courses and several lessons to review. I appreciated the time. I spent the week writing at the computer. I had a couple of articles to finish up and all of the samples for those articles to knit. Not much fun. I also am finishing up Lesson 2 of the Gauge class. I finished up today. It covers gauge swatches for lace and circular knitting plus using gauge to adapt patterns. I finished up the Finishing Class I taught at home. It was a lot of fun. I hope that the students thought so also. Thanks to Stephanie for the delicious cookies and to Mary and Elisha for the Garretts popcorn! One of the things I have learned as a teacher is that everyone learns in a different way. It is the job of a teacher to figure out methods that help students with different learning styles. What is easy for one student may be difficult for another. This is particularly true for the duplicate stitch method of weaving in yarn tails where stockinette is the RS. This past week I had several students have difficulty with this. I spent some time trying to think of alternate ways to explain this. Let me know if this helps. 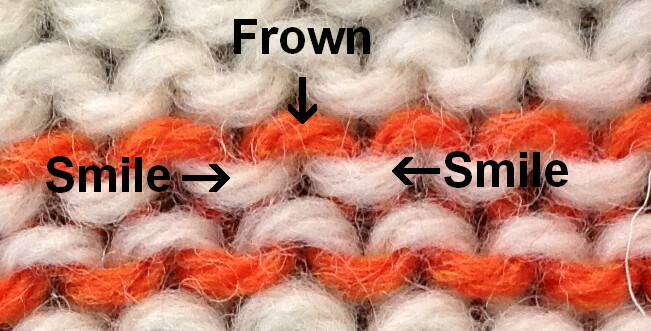 This photo shows the stitch anatomy of reverse stockinette. The stitch itself looks like a frown. (On the stockinette side, this is the top of the "V". ) The spaces on either side of the stitch look like smiles. (On the stockinette side, these are horizontal bars between the "V"s. Notice how the stitch interlocks with the smiles and then into the frown of the stitch in the row below. 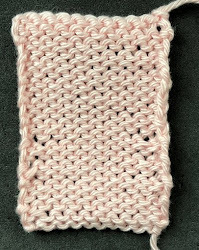 For decorative duplicate stitch you go completely under the stitches but to hide yarn tail you don't want to do this. Slightly split the smiles and frowns as you insert the needle and this will keep the tail on the back of the work. I used a different colorway for these socks. 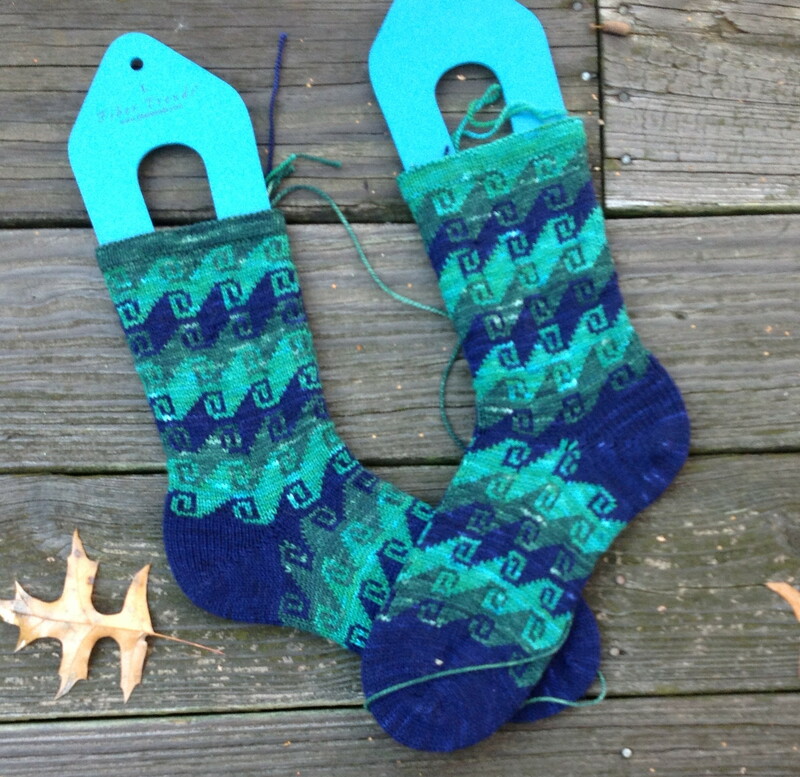 The colorway in the original would require you to buy two packs of the yarn to make one pair of socks. True, you could use the yarns for mittens or some such thing but I thought it was only fair to come up with a colorway that uses one pack of yarn. I like this one as well. I am actually going to keep this pair after the photo shoot as it was my idea to do them. I liked this pattern so much I've decided to use it for some Redfish yarn I bought years ago. Who knows when I'll get around to that pattern! Now I have started on personal projects. I've got birthday presents to do, a couple of baby gifts, Christmas and the project I am doing now for a friend. I am calling them "National Sparkle Day" mitts. There is a very funny story behind the mitts but it isn't my story to tell and I don't want to get anyone in trouble. The alternate name is "Happy Sparkle Day" mitts. That story I can tell. A friend of mine has a friend who lives in Japan. My friend used the computer to translate something on her friend's facebook page. You got it, the translation was "Happy Sparkle Day." Lion Brand included some Vanna's Glamour yarn in the goody bags at the TKGA conference in Reno. I managed to snag extra from committee members. I'll post photos of the mitts next week. Thank you for the numbered stitch path; it is incredibly helpful.